A couple of days ago I finally got round to sitting down and watching the recent documentary on BBC4 about Blondie’s Parallel Lines. It’s worth seeing (watch it here), and re-ignitied my often dormant fantasy of trying to do a ukulele-based full-album show featuring Parallel Lines, in sequence! I don’t suppose that will ever come to fruition, but it did prompt me to have a go at this song, the second track from this album I’ve posted on here (see the previous post of Picture This). Surprisingly I couldn’t find a ukulele sheet for this song (that wasn’t polluted by 1D!) so here is one. It’s a mark of just how much a classic Parallel Lines is, that even an album track such as this is so well known. I’m not even going to entertain the notion that this is due to the ghastly One Direction mash-up with Teenage Kicks (it’s appearance in the Rugrats movie gives it more credibility than that!). One Way Or Another is a classic of the Debbie Harry “attitude” school, spat out with the venom of a (presumably somewhat aggrieved) stalker who’s going to see ya / meetcha / getcha / trick ya. You really wouldn’t want to be on the receiving end of that treatment. There’s an interesting segment in that documentary (starting at 4:31) on the song, it’s genesis and recording. So here’s the song sheet. For what might come across as a simple song there’s a lot of chords, but nothing too tricksy as long as you’re comfortable with barre chords. I’ve shown the chords as barre chords on the songsheet as they do work better that way, so if you can play them like that do. And if you can’t, practice! I found the little runs in the verse from D/C#/C/B and back again need a bit of concentration to get the timing right (it’s quite quick). The strumming pattern is something you need to listen to the original for, particularly in the verse where a nice bit of damping and scratching of the strings with the left hand gives it that chunky feel (see http://en.wikipedia.org/wiki/Damping_(music) – I had to look the terms up!). As ever, listen and play along to the original to get the overall feel and timing (it’s in the same key). And enjoy! 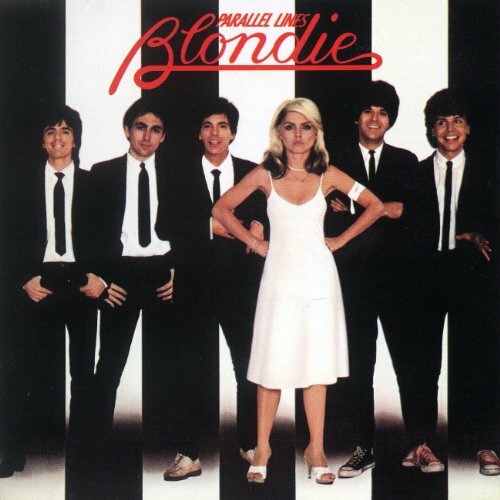 Categories: New Wave, Rock | Tags: 1970s, 1978, Blondie, New Wave, Pop, Rock, ukulele | Permalink. I’ve been going through something of a country phase lately. Things tend to go like that for me, but certainly for the last 6 months or so there’s definitely been a country bias to my listening. Albums from Sturgill Simpson (Metamodern Sounds In Country Music), Suzy Bogguss (Lucky) and Willie Watson (Folk Singer Volume 1) have all been highly enjoyed, alongside older albums from Laura Cantrell and Rodney Crowell. 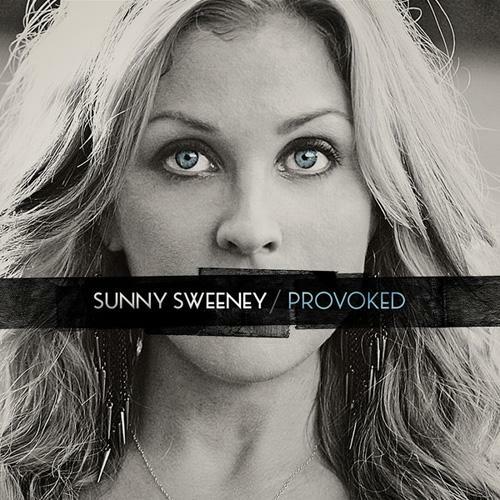 But most recently it’s been Provoked by Texas singer/songwriter Sunny Sweeney that I’ve been really getting into. I hadn’t even heard of Sunny until very recently, but through one of those “if-you-liked-such-and-such-you-might-like-this” recommendations I gave her a go. And what a great little record it is. Provoked is fairly straight down the line country, and appears to be her first album since being dropped by her previous record company (home to Taylor Swift) and a divorce. Those events clearly had a strong influence on the songs on this album, but not in a woe-is-me kind of way, rather in a sassy, fighter / survivor kind of way. This is clearly not a woman to be messed with! Backhanded Compliment is from that album, and is a very funny response to those kind of double-edged comments which we’ve probably all been subject to – which say one thing but clearly, intentionally or not, mean another. Set to a bouncing rhythm, it’s clearly written from a woman’s perspective, and she’s not shy with the comeback! And so to the song sheet. Nothing particularly complicated in here, other than the fact that it’s in Bb, which results in some slightly unusual chords (if you want it in an easier key – to play – try this version in G). A nice chugga-chugga rhythm is all that’s needed (listen to the video to get an idea). And enjoy! Categories: Country | Tags: 2000s, 2014, Country, Singer-Songwriter, Sunny Sweeney, ukulele | Permalink. Musicals are a strange beast. Some people can’t stand them, and certainly in some circles your musical credibility takes a nose-dive if you express even a smidgen of interest in them. Others love them, particularly the escapist, fantasy world they can create, and there’s a whole world of them out there that you can lose yourself in if you wish. Me, I sit somewhere in the middle of those extremes (what do you know!). For me, the best musicals take you on an emotional journey where music, lyric, story and staging combine to create a credible other world that does something none of those elements can do on their own. So shows like Les Miserables, West Side Story and Blood Brothers, neither of which could be classified as escapist fun, are ones I would see over and again. Of the little I’ve come across (A Little Night Music and Into The Woods) I’ve really enjoyed Stephen Sondheim’s work as well, even though they’re not big on blockbuster tunes (the classic Send In The Clowns excepted). More recently Matilda was one I particularly enjoyed. But I also have time for the more traditional musicals, particularly those from the golden age of such in the mid 20th-century. I think that may be partly my parents fault(!) but shows like Seven Brides For Seven Brothers, Calamity Jane, Annie Get Your Gun and 42nd Street are just feel good bonanza’s. 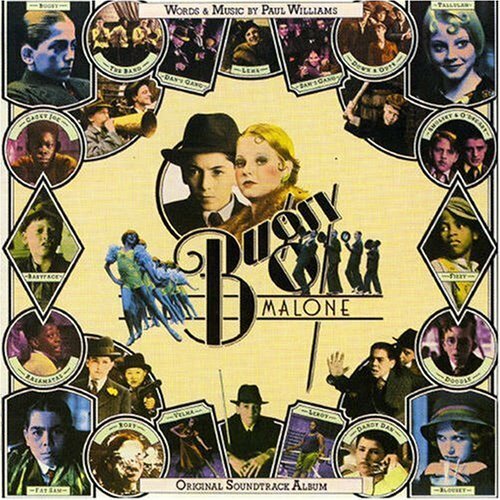 But for sheer fun and feel-good vibes, you’d have to go a long way to beat Bugsy Malone. Featuring an all-child cast (including Jodie Foster and Scott Baia) the show is set in 1920s America during prohibition, and focusses on the exploits of a bunch of gangsters, although with the real-life bullets and machine guns being replaced with custard-shooting splurge guns. Directed by Alan Parker, whose film career has included other musicals such as Fame, The Commitments and Evita, the music was written by Paul Williams, notable for pop successes such as We’ve Only Just Begun for The Carpenters, and Evergreen, sung by Barbara Streisand from the film A Star Is Born. But for Bugsy, he composed a set of songs that reflect both the time the film is set, but also give it a more (1970s) contemporary feel. You Give A Little Love is the rousing, sing-along closing song from the film, noticably sung after the mother of all splurge gun fights, with the whole cast covered in custard! So here’s the song sheet. I thought this might work largely because the instrumentation on the original (is that a banjo in there) seemed to lend itself to a strummed ukulele. I can’t find a lot of evidence that this does work out there, but having played with this a bit I’m sure it will. The chords are reasonably straightforward, although you can embelish it with – in particular – a nice G / F# / F / E7 run at the end of the third line in each verse (it is a bit quick, though). And playing the A chord in the second line as a slide up two frets from the G in the first line works well too. I’ve also transcribed the introduction – a nice clashing chord followed by a little riff. Listen to the original and you’ll work it out. Oh, and keep going at the end for as long as you want. Enjoy! Categories: Musical, Uncategorized | Tags: 1970s, 1976, Musical, ukulele | Permalink.